First, let’s look at having only one huge file to deal with, which in my case starts at about above 256MBytes in size. I often setup my captures for file sizes of 128 or 256MBytes, because they are still “okay-ish” when opened in Wireshark – it takes some time to load and filter them, but it’s not too bad. But when I end up with files larger than that – sometimes more than 10GBytes in size – that won’t work anymore. It’s not so much that Wireshark can’t load the file – because it often can, at least the recent versions. The developers worked hard on improving this, and you can now open files that you couldn’t a couple of years ago. But the initial loading of a file isn’t the time-consuming part when you perform a packet analysis task – filtering is. Each display filter you apply re-reads the whole file from disk. Each and every time, because Wireshark doesn’t keep packets in memory, except the one packet currently decoded and displayed. So if you apply a filter in any way, Wireshark needs to read all packets again to check if they match the current filter condition. And this means that working on large files will be slow, and as always, time is something you often do not have when you’re troubleshooting or perfoming a forensic investigation where getting to results fast is critical. Pro Tip: use the “find” function (Shortcut: CTRL-F) in Wireshark with a filter expression to find matching packets without applying the filter itself. This can often save a lot of time. A word of warning – some formats may not be able to be converted to each other, depending on how different the formats area. 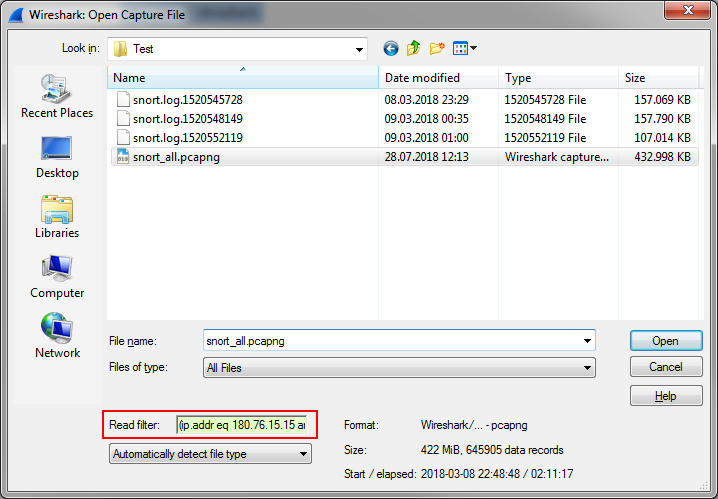 Merge all capture files together first with mergecap (also part of the Wireshark command line tool set) and carve the flow you need from the big merged file. The main problem here is that you may end up with a file so big that most carving tools cannot process it anymore. Cut the partial flows from each partial file and merge the extracted packets together as a final step. This often works best, e.g. using tshark or tcpdump in a batch job on all files and mergecap afterwards. The “-a” parameter tells mergecap to concatenate files instead of merging them by frame timestamp. For that you should make sure your file names are listed in chronological order, otherwise you’ll have time jumps in the merge file. In that case just omit the “-a” parameter and let mergecap sort the frames for you. Pro Tip: there are some older versions of mergecap (1.x, I can’t remember exactly) which do not work with wildcards, requiring you to specify all files instead. I recommend getting a newer Wireshark installation instead of doing that. Very often we need to extract specific packets from a big pile to investigate what’s going on. This is especially true for network forensics investigations, but also for some network analysis jobs where you have a 24/7 capture running and need to find the packets of a specific conversation. There is a range of tools for that kind of thing, and I’ll cover a few of them now. I found a lot of tools in general, but I skipped all that were either too outdated, or didn’t produce packet extractions (like tcpflow, which extracts the contents on top of TCP, not the packets themselves). Of course you can use Wireshark to extract packets from your capture files. It’s probably the most versatile tool to do that, too (together with tshark). The power comes from the sheer amount of display filters that you can apply to get what you want, and saving the filtered results to a new file. In most situations this would mean to apply a conversation filter to isolate a single TCP connection. Or a couple of them. On the other hand, Wireshark may be too complicated to use for an extraction task, because it requires a high amount of manual interaction to get the results you need. Pro Tip: when new Wireshark versions are released, new protocol dissectors added to the code are enabled by default, so you might want to check your reduced profiles and disable the new dissectors unless you need them. tcpdump is very similar in usage to tshark, with one key difference: it doesn’t support the hundreds of thousands of display filters tshark has, so it’s much more limited in what you can filter on. But on the upside tcpdump also has one big advantage: since it can filter using BPF without the display filter engine overhead, it’s fast. Very fast. And if you only care about things like conversations, it’s probably the best command line tool there is for that task. tcpdump -r capture.pcap -w filtered.pcap "host 192.168.0.1 and 10.0.0.1 and tcp port 54321 and 80"
Keep in mind that tcpdump cannot write the pcapng file format yet, and only reads pcapng if the libpcap version it uses supports it. There also is a Windows version called windump, but it seems to be discontinued and is limited to pcap files only. So if you want to run it against a set of pcapng files you need to convert them first, which also takes time. 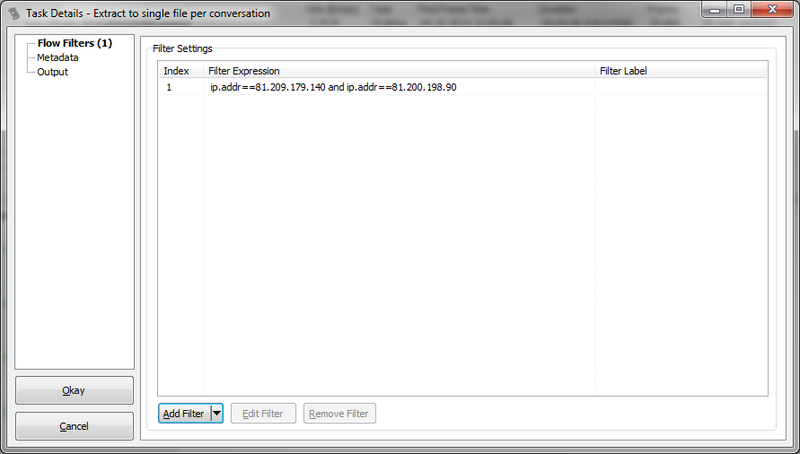 I once filtered hundreds of conversations from a set of hundreds of files using Wireshark and it took two days. Since then I have learned to do it in smarter ways, e.g. by using tcpdump instead of Wireshark. But that still requires running over the file set hundreds of times instead of just once. So I added extraction capabilities to TraceWrangler, and even though it’s nearly not as powerful as tshark or even tcpdump when it comes to the filter engine, it is very convenient to use. And it only requires one run to extract to multiple filters at the same time. And there is also a special mode where it can extract conversations based on Snort alert file results, which I blogged about here. There are two main ways of extracting packets with TraceWrangler: either via the Conversation Summary, or by using an Extraction Task. Double clicking any row extracts the full conversation to a temporary file and opens Wireshark with it. You can also select multiple rows and use the popup menu instead, or toggle aggregated mode (CTRL-O) to have all conversations listed below the respective IP pair. 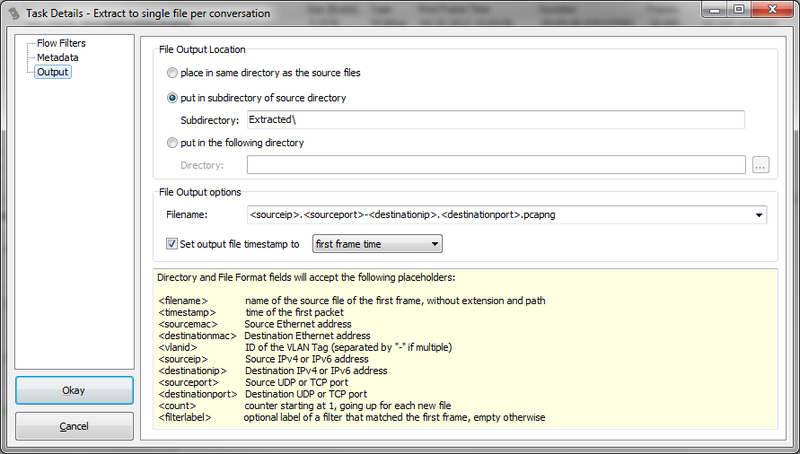 The table also has a couple of extra values Wireshark doesn’t have (yet), e.g. the iRTT (if available), the packet ratio (indicating which IP sends how much of the total traffic), or a Status column which shows details about handshake and teardown (still has some issues I need to fix). Extraction tasks are quite powerful through a feature that doesn’t look like much: the output filename pattern.With that pattern you can control in which file the extracted packets will end up, e.g. splitting them by socket pairs, or IPs, or VLANs and many other values. Depending on how you set it TraceWrangler will aggregate packets into output files. By default this will be files based on the socket pairs (both IPs and ports), but you can set it to something like <sourceip>-<destinationip> if you want all packets of each IP pair in a single file. It may be noteworthy that you can also use the placeholders for the directory values, e.g. creating a directory for the IP pairs and socket based file names inside of them. So in the end it’s irrelevant how you captured your packets, as long as you did capture them. The only drawback of having to merge or split them is that it takes time for the file operations – and that can get significant for TByte sized amounts of packets, especially if you also have to convert from pcapng to pcap or vice versa. There are a number of other pcap-related tools available that may be of interest to some readers. The Wireshark wiki Tools page lists many of them: https://wiki.wireshark.org/Tools#Monitoring.2Ftracing_tools. The windows application pcapdatacopy I put together a while ago is on the wiki tools list. You can use it to merge pcap files and also create a filtered pcap file from a single or multiple files based on the source and destination ip addresses. For parsing huge files I find it quicker to use, another feature I regularly use is to create a raw copy of the payload data which is great for analysing text based messages. Thanks Stuart, never heard of that one but it sounds useful! Hi Joao, thank you! And I fixed the typo, thx for letting me know!